What if research could identify a way to give your body a fighting chance? Kick-start the path to healing? The goal of surgery is clear. To stop an active bleed from creating a heavier or more widespread iron build-up. Newly diagnosed patients are often confused by the chelation process. Will it make the symptoms better? Will it make me better? The purpose of chelation is to remove the iron and stop your cell damage from progressing. It won’t address the damage already done. In theory, if you remove the build-up, you can slow or arrest the deterioration. Maybe then, your cells have a chance to begin the healing process. The dream of patient-powered research was the seed that became our Superficial Siderosis Patient Registry. A community website where we can overcome the geographic distance between us to collect data and offer everyone the chance to participate in new studies as they become available. All studies need a researcher and funding, but more importantly data. We have begun the search for grant money so a natural history study can be completed on superficial siderosis. The knowledge of a rare disease or conditions natural history is a vital step in laying the foundation for a successful clinical development program. That’s especially true when developing or discovering drugs to treat rare diseases which are not understood. A natural history study would track the course of superficial siderosis as it progresses naturally if left untreated. Dr. Michael Levy has agreed to oversee this research, and when the time comes, we will need to reach out to those who have chosen to allow the natural progression. A funding source is also required to initiate the two-year randomized, double-blind placebo control study of the efficacy of Ferriprox (Deferiprone). 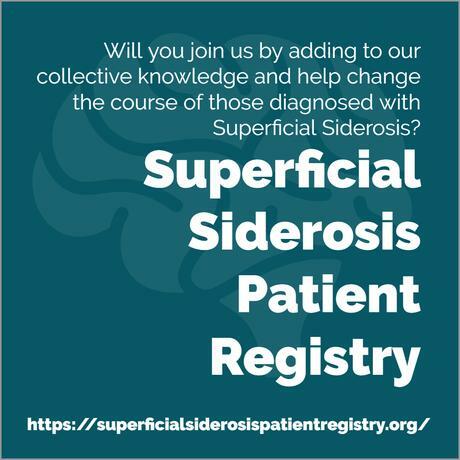 Our first registry effort will be the creation of The Superficial Siderosis Research Tissue Donation Project. We still have many details to work on, but this project is vital to the future of superficial siderosis. Research takes a very long time, so as hard as it may be to face, even though some of our community friends will never experience the benefits you still have an opportunity to contribute. To make a difference to those who follow with a real chance to live a better life. Kyle Dempsy has spearheaded the fundraising effort in the United States while Jason Roberts and the Silent Bleed Charity have worked their magic from the United Kingdom. We recognize that not everyone is able to help financially, but we are looking for project volunteers. End-of-life donation of brain and spinal cord tissue for superficial siderosis research is the most generous gift you can make. It’s not a happy place, contemplating your mortality, but we need ten volunteers at a minimum who will consent to this donation so steps may be put in place ahead of time. You have the opportunity to help in Dr. Levy’s quest to find answers. By improving the understanding of superficial siderosis and the pathophysiology, research will be able to explain the functional changes at a cellular level that are occurring within an individual due to superficial siderosis. By exposing the how’s and why’s, we can empower researchers to not only discover better treatments but ultimately a pathway to healing. We realize there will be some cost involved with a donation of this type, so we are committed to raising funds so your family will not have to shoulder the burden of an added expense. All tissue donations and records will be stored under the supervision of Dr. Levy and his team. Donors will be released to your family after the procedure is complete and will in no way interfere with internment plans. Once we have a clear view on how to organize this process, an information packet will be available on the patient registry website. Construction on this new website section will begin soon. All registered patients and caregivers will receive updates via the registry email list. Spinal cord and brain injuries tell us our bodies can be very resilient. We have a very long way to go, but baby steps begin every journey.